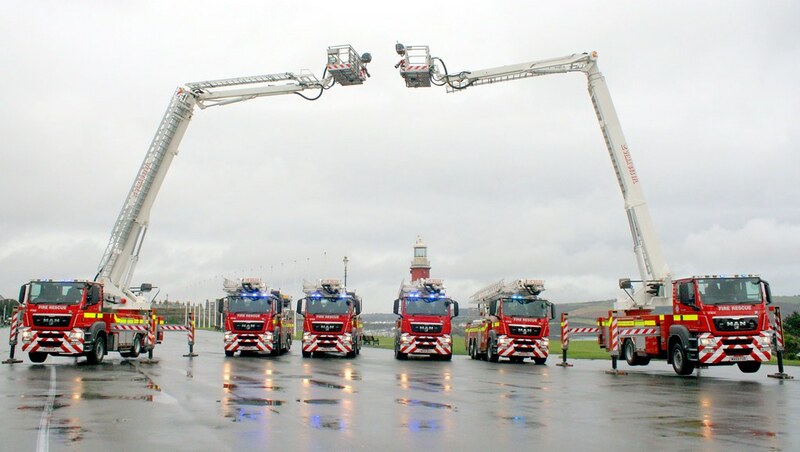 Plymouth Hoe staged the dramatic backdrop for the launch of six new Aerial Ladder Platforms (ALPs), five for Devon and Somerset Fire and Rescue Service and the sixth for Cornwall Fire and Rescue Service. This is the first joint regional procurement project of its kind between the two Services at an investment of 2.2 million. The new ALPs are replacing existing appliances which are approaching the end of their life-cycle and due to go on the run in July, after training has taken place. Training is required in various areas, and will be rolled out through March, April and May. The driver training lasts for one day, the operator instructor training for five days and will include instructors from all of the five stations who are due to receive the vehicles. • The Cornwall appliance will be located at Newquay. The vehicles were purchased as part of the Firebuy national framework contract. To say the photography was 'challenging' is the understatement of the year. Conditions were horrendous with heavy, swirling continuous heavy rain and a somewhat low cloud base! Any half-decent print is a miracle! From left to right: WA59FUF, WA59FUB, WA59FUG, WK59BPZ, WA59FUE, WA59FUD. I think you can spot the Cornish one!